...continued from home page...needs. Bandon is a true satellite school, with classes in TKD held two days a week. Jim Saxton is the primary teacher in Bandon, but Karen, Dane and Nikki teach in Bandon on occasion. your name, address, phone number, and prospective students' name(s) and we will schedule your intro for you. Nothing to lose by trying a class today! We are the oldest martial arts school in Bandon, having started at the Bandon Community building in 2003 and moving to the Bandon Shopping Center in February of 2008. Thus we are celebrating our 8th year continuous year serving the community of Bandon. We offer TKD instruction in Bandon on Mondays and Wednesdays from 4pm to 7pm. Monday and Wednesday, with Tae Kwon Do (including pre-school). 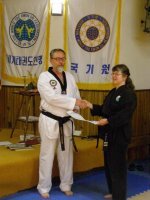 While Tae Kwon do students are encouraged to come to the main dojang on Fridays for extra sparring or to make up missed classes, a full TKD curriculum can be had from the Bandon location. Jim Saxton teaches at our Bandon facility. You may start these classes at anytime. If you call the main dojo ahead of time, we will do our best to have everything ready for your first class. Coquille office hours are all day Tuesday and Friday, and Thursday afternoons. We are also in the office most mornings, so please leave us a message and we will be glad to call back to answer any questions you may have. With 9 years at our Bandon location and 14 in Coquille, we have a track record that is proven. We teach your child self respect and respect for others in a safe, nurturing but tightly disciplined fashion. The martial arts have the lowest incidents of injury among children when properly taught. We teach a full martial arts curriculum using TKD as our base art, and hapkido for self defense. 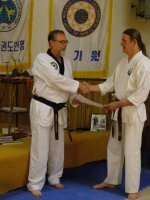 Our instructors are backed by the Kukkiwon(World TaeKwondo headquarters) in S Korea and the United Hapkido federation headed by Grandmaster Suggs. As with any profession, professional development hours and training is important. Our head instructors average 8 hours a month training to keep their material fresh and up to date, working with notable instructors in Tae Kwon Do, Hapikdo, Systema and blade work. Feel free to ask what seminars we have taken this year!